Information security, sometimes shortened to InfoSec, is the practice of preventing unauthorized access, use, disclosure, disruption, modification, inspection, recording or destruction of information. The information or data may take any form, e.g. electronic or physical. Information security's primary focus is the balanced protection of the confidentiality, integrity and availability of data (also known as the CIA triad) while maintaining a focus on efficient policy implementation, all without hampering organization productivity. This is largely achieved through a multi-step risk management process that identifies assets, threat sources, vulnerabilities, potential impacts, and possible \controls, followed by assessment of the effectiveness of the risk management plan. To standardize this discipline, academics and professionals collaborate and seek to set basic guidance, policies, and industry standards on password, antivirus software, firewall, encryption software, legal liability and user/administrator training standards. This standardization may be further driven by a wide variety of laws and regulations that affect how data is accessed, processed, stored, and transferred. However, the implementation of any standards and guidance within an entity may have limited effect if a culture of continual improvement isn't adopted. At the core of information security is information assurance, the act of maintaining the confidentiality, integrity and availability (CIA) of information, ensuring that information is not compromised in any way when critical issues arise. These issues include but are not limited to natural disasters, computer/server malfunction, and physical theft. While paper-based business operations are still prevalent, requiring their own set of information security practices, enterprise digital initiatives are increasingly being emphasized, with information assurance now typically being dealt with by information technology (IT) security specialists. These specialists apply information security to technology (most often some form of computer system). It is worthwhile to note that a computer does not necessarily mean a home desktop. A computer is any device with a processor and some memory. Such devices can range from non-networked standalone devices as simple as calculators, to networked mobile computing devices such as smartphones and tablet computers. IT security specialists are almost always found in any major enterprise/establishment due to the nature and value of the data within larger businesses. They are responsible for keeping all of the technology within the company secure from malicious cyber attacks that often attempt to acquire critical private information or gain control of the internal systems. The field of information security has grown and evolved significantly in recent years. It offers many areas for specialization, including securing networks and allied infrastructure, securing applications and databases, security testing, information systems auditing, business continuity planning, electronic record discovery, and digital forensics. Information security professionals are very stable in their employment. As of 2013[update] more than 80 percent of professionals had no change in employer or employment over a period of a year, and the number of professionals is projected to continuously grow more than 11 percent annually from 2014 to 2019. Information security threats come in many different forms. Some of the most common threats today are software attacks, theft of intellectual property, identity theft, theft of equipment or information, sabotage, and information extortion. Most people have experienced software attacks of some sort. Viruses, worms, phishing attacks, and Trojan horses are a few common examples of software attacks. The theft of intellectual property has also been an extensive issue for many businesses in the IT field. Identity theft is the attempt to act as someone else usually to obtain that person's personal information or to take advantage of their access to vital information. Theft of equipment or information is becoming more prevalent today due to the fact that most devices today are mobile, are prone to theft and have also become far more desirable as the amount of data capacity increases. Sabotage usually consists of the destruction of an organization's website in an attempt to cause loss of confidence on the part of its customers. Information extortion consists of theft of a company's property or information as an attempt to receive a payment in exchange for returning the information or property back to its owner, as with ransomware. There are many ways to help protect yourself from some of these attacks but one of the most functional precautions is user carefulness. Governments, military, corporations, financial institutions, hospitals and private businesses amass a great deal of confidential information about their employees, customers, products, research and financial status. Should confidential information about a business' customers or finances or new product line fall into the hands of a competitor or a black hat hacker, a business and its customers could suffer widespread, irreparable financial loss, as well as damage to the company's reputation. From a business perspective, information security must be balanced against cost; the Gordon-Loeb Model provides a mathematical economic approach for addressing this concern. For the individual, information security has a significant effect on privacy, which is viewed very differently in various cultures. Since the early days of communication, diplomats and military commanders understood that it was necessary to provide some mechanism to protect the confidentiality of correspondence and to have some means of detecting tampering. Julius Caesar is credited with the invention of the Caesar cipher c. 50 B.C., which was created in order to prevent his secret messages from being read should a message fall into the wrong hands; however, for the most part protection was achieved through the application of procedural handling controls. Sensitive information was marked up to indicate that it should be protected and transported by trusted persons, guarded and stored in a secure environment or strong box. As postal services expanded, governments created official organizations to intercept, decipher, read and reseal letters (e.g., the U.K.'s Secret Office, founded in 1653). In the mid-nineteenth century more complex classification systems were developed to allow governments to manage their information according to the degree of sensitivity. For example, the British Government codified this, to some extent, with the publication of the Official Secrets Act in 1889. By the time of the First World War, multi-tier classification systems were used to communicate information to and from various fronts, which encouraged greater use of code making and breaking sections in diplomatic and military headquarters. Encoding became more sophisticated between the wars as machines were employed to scramble and unscramble information. The volume of information shared by the Allied countries during the Second World War necessitated formal alignment of classification systems and procedural controls. An arcane range of markings evolved to indicate who could handle documents (usually officers rather than enlisted troops) and where they should be stored as increasingly complex safes and storage facilities were developed. The Enigma Machine, which was employed by the Germans to encrypt the data of warfare and was successfully decrypted by Alan Turing, can be regarded as a striking example of creating and using secured information. Procedures evolved to ensure documents were destroyed properly, and it was the failure to follow these procedures which led to some of the greatest intelligence coups of the war (e.g., the capture of U-570). The end of the twentieth century and the early years of the twenty-first century saw rapid advancements in telecommunications, computing hardware and software, and data encryption. The availability of smaller, more powerful and less expensive computing equipment made electronic data processing within the reach of small business and the home user. These computers quickly became interconnected through the internet. The rapid growth and widespread use of electronic data processing and electronic business conducted through the internet, along with numerous occurrences of international terrorism, fueled the need for better methods of protecting the computers and the information they store, process and transmit. The academic disciplines of computer security and information assurance emerged along with numerous professional organizations, all sharing the common goals of ensuring the security and reliability of information systems. Information Security Attributes: or qualities, i.e., Confidentiality, Integrity and Availability (CIA). Information Systems are composed in three main portions, hardware, software and communications with the purpose to help identify and apply information security industry standards, as mechanisms of protection and prevention, at three levels or layers: physical, personal and organizational. Essentially, procedures or policies are implemented to tell administrators, users and operators how to use products to ensure information security within the organizations. The CIA triad of confidentiality, integrity, and availability is at the heart of information security. (The members of the classic InfoSec triad—confidentiality, integrity and availability—are interchangeably referred to in the literature as security attributes, properties, security goals, fundamental aspects, information criteria, critical information characteristics and basic building blocks.) However, debate continues about whether or not this CIA triad is sufficient to address rapidly changing technology and business requirements, with recommendations to consider expanding on the intersections between availability and confidentiality, as well as the relationship between security and privacy. Other principles such as "accountability" have sometimes been proposed; it has been pointed out that issues such as non-repudiation do not fit well within the three core concepts. 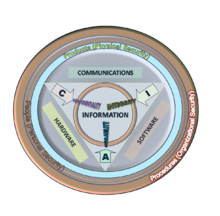 In 1998, Donn Parker proposed an alternative model for the classic CIA triad that he called the six atomic elements of information. The elements are confidentiality, possession, integrity, authenticity, availability, and utility. The merits of the Parkerian Hexad are a subject of debate amongst security professionals. In 2011, The Open Group published the information security management standard O-ISM3. This standard proposed an operational definition of the key concepts of security, with elements called "security objectives", related to access control (9), availability (3), data quality (1), compliance and technical (4). In 2009, DoD Software Protection Initiative released the Three Tenets of Cybersecurity which are System Susceptibility, Access to the Flaw, and Capability to Exploit the Flaw. Neither of these models are widely adopted. In information security, confidentiality "is the property, that information is not made available or disclosed to unauthorized individuals, entities, or processes." While similar to "privacy," the two words aren't interchangeable. Rather, confidentiality is a component of privacy that implements to protect our data from unauthorized viewers. Examples of confidentiality of electronic data being compromised include laptop theft, password theft, or sensitive emails being sent to the incorrect individuals. In information security, data integrity means maintaining and assuring the accuracy and completeness of data over its entire lifecycle. This means that data cannot be modified in an unauthorized or undetected manner. This is not the same thing as referential integrity in databases, although it can be viewed as a special case of consistency as understood in the classic ACID model of transaction processing. Information security systems typically provide message integrity along side to confidentiality. For any information system to serve its purpose, the information must be available when it is needed. This means the computing systems used to store and process the information, the security controls used to protect it, and the communication channels used to access it must be functioning correctly. High availability systems aim to remain available at all times, preventing service disruptions due to power outages, hardware failures, and system upgrades. Ensuring availability also involves preventing denial-of-service attacks, such as a flood of incoming messages to the target system, essentially forcing it to shut down. In the realm of information security, availability can often be viewed as one of the most important parts of a successful information security program. Ultimately end-users need to be able to perform job functions; by ensuring availability an organization is able to perform to the standards that an organization's stakeholders expect. This can involve topics such as proxy configurations, outside web access, the ability to access shared drives and the ability to send emails. Executives oftentimes do not understand the technical side of information security and look at availability as an easy fix, but this often requires collaboration from many different organizational teams, such as network operations, development operations, incident response and policy/change management. A successful information security team involves many different key roles to mesh and align for the CIA triad to be provided effectively. In law, non-repudiation implies one's intention to fulfill their obligations to a contract. It also implies that one party of a transaction cannot deny having received a transaction, nor can the other party deny having sent a transaction. It is important to note that while technology such as cryptographic systems can assist in non-repudiation efforts, the concept is at its core a legal concept transcending the realm of technology. It is not, for instance, sufficient to show that the message matches a digital signature signed with the sender's private key, and thus only the sender could have sent the message, and nobody else could have altered it in transit (data integrity). The alleged sender could in return demonstrate that the digital signature algorithm is vulnerable or flawed, or allege or prove that his signing key has been compromised. The fault for these violations may or may not lie with the sender, and such assertions may or may not relieve the sender of liability, but the assertion would invalidate the claim that the signature necessarily proves authenticity and integrity. As such, the sender may repudiate the message (because authenticity and integrity are pre-requisites for non-repudiation). Risk analysis and risk evaluation processes have their limitations since, when security incidents occur, they emerge in a context, and their rarity and uniqueness give rise to unpredictable threats. The analysis of these phenomena, which are characterized by breakdowns, surprises and side-effects, requires a theoretical approach that is able to examine and interpret subjectively the detail of each incident. The likelihood that a threat will use a vulnerability to cause harm creates a risk. When a threat does use a vulnerability to inflict harm, it has an impact. In the context of information security, the impact is a loss of availability, integrity, and confidentiality, and possibly other losses (lost income, loss of life, loss of real property). It should be pointed out that it is not possible to identify all risks, nor is it possible to eliminate all risk. The remaining risk is called "residual risk." Selecting and implementing proper security controls will initially help an organization bring down risk to acceptable levels. Control selection should follow and should be based on the risk assessment. Controls can vary in nature, but fundamentally they are ways of protecting the confidentiality, integrity or availability of information. ISO/IEC 27001 has defined controls in different areas. Organizations can implement additional controls according to requirement of the organization. ISO/IEC 27002 offers a guideline for organizational information security standards. Administrative controls consist of approved written policies, procedures, standards and guidelines. Administrative controls form the framework for running the business and managing people. They inform people on how the business is to be run and how day-to-day operations are to be conducted. Laws and regulations created by government bodies are also a type of administrative control because they inform the business. Some industry sectors have policies, procedures, standards and guidelines that must be followed – the Payment Card Industry Data Security Standard (PCI DSS) required by Visa and MasterCard is such an example. Other examples of administrative controls include the corporate security policy, password policy, hiring policies, and disciplinary policies. Administrative controls form the basis for the selection and implementation of logical and physical controls. Logical and physical controls are manifestations of administrative controls, which are of paramount importance. Logical controls (also called technical controls) use software and data to monitor and control access to information and computing systems. Passwords, network and host-based firewalls, network intrusion detection systems, access control lists, and data encryption are examples of logical controls. An important logical control that is frequently overlooked is the principle of least privilege, which requires that an individual, program or system process not be granted any more access privileges than are necessary to perform the task. A blatant example of the failure to adhere to the principle of least privilege is logging into Windows as user Administrator to read email and surf the web. Violations of this principle can also occur when an individual collects additional access privileges over time. This happens when employees' job duties change, employees are promoted to a new position, or employees are transferred to another department. The access privileges required by their new duties are frequently added onto their already existing access privileges, which may no longer be necessary or appropriate. Physical controls monitor and control the environment of the work place and computing facilities. They also monitor and control access to and from such facilities and include doors, locks, heating and air conditioning, smoke and fire alarms, fire suppression systems, cameras, barricades, fencing, security guards, cable locks, etc. Separating the network and workplace into functional areas are also physical controls. An important physical control that is frequently overlooked is separation of duties, which ensures that an individual can not complete a critical task by himself. For example, an employee who submits a request for reimbursement should not also be able to authorize payment or print the check. An applications programmer should not also be the server administrator or the database administrator; these roles and responsibilities must be separated from one another. Information security must protect information throughout its lifespan, from the initial creation of the information on through to the final disposal of the information. The information must be protected while in motion and while at rest. During its lifetime, information may pass through many different information processing systems and through many different parts of information processing systems. There are many different ways the information and information systems can be threatened. To fully protect the information during its lifetime, each component of the information processing system must have its own protection mechanisms. The building up, layering on and overlapping of security measures is called "defense in depth." In contrast to a metal chain, which is famously only as strong as its weakest link, the defense in depth strategy aims at a structure where, should one defensive measure fail, other measures will continue to provide protection. Recall the earlier discussion about administrative controls, logical controls, and physical controls. The three types of controls can be used to form the basis upon which to build a defense in depth strategy. With this approach, defense in depth can be conceptualized as three distinct layers or planes laid one on top of the other. Additional insight into defense in depth can be gained by thinking of it as forming the layers of an onion, with data at the core of the onion, people the next outer layer of the onion, and network security, host-based security and application security forming the outermost layers of the onion. Both perspectives are equally valid, and each provides valuable insight into the implementation of a good defense in depth strategy. An important aspect of information security and risk management is recognizing the value of information and defining appropriate procedures and protection requirements for the information. Not all information is equal and so not all information requires the same degree of protection. This requires information to be assigned a security classification. The first step in information classification is to identify a member of senior management as the owner of the particular information to be classified. Next, develop a classification policy. The policy should describe the different classification labels, define the criteria for information to be assigned a particular label, and list the required security controls for each classification. Some factors that influence which classification information should be assigned include how much value that information has to the organization, how old the information is and whether or not the information has become obsolete. Laws and other regulatory requirements are also important considerations when classifying information. The Information Systems Audit and Control Association (ISACA) and its Business Model for Information Security also serves as a tool for security professionals to examine security from a systems perspective, creating an environment where security can be managed holistically, allowing actual risks to be addressed. Access to protected information must be restricted to people who are authorized to access the information. The computer programs, and in many cases the computers that process the information, must also be authorized. This requires that mechanisms be in place to control the access to protected information. The sophistication of the access control mechanisms should be in parity with the value of the information being protected; the more sensitive or valuable the information the stronger the control mechanisms need to be. The foundation on which access control mechanisms are built start with identification and authentication. Authentication is the act of verifying a claim of identity. When John Doe goes into a bank to make a withdrawal, he tells the bank teller he is John Doe, a claim of identity. The bank teller asks to see a photo ID, so he hands the teller his driver's license. The bank teller checks the license to make sure it has John Doe printed on it and compares the photograph on the license against the person claiming to be John Doe. If the photo and name match the person, then the teller has authenticated that John Doe is who he claimed to be. Similarly, by entering the correct password, the user is providing evidence that he/she is the person the username belongs to. Strong authentication requires providing more than one type of authentication information (two-factor authentication). The username is the most common form of identification on computer systems today and the password is the most common form of authentication. Usernames and passwords have served their purpose, but they are increasingly inadequate. Usernames and passwords are slowly being replaced or supplemented with more sophisticated authentication mechanisms such as Time-based One-time Password algorithms. After a person, program or computer has successfully been identified and authenticated then it must be determined what informational resources they are permitted to access and what actions they will be allowed to perform (run, view, create, delete, or change). This is called authorization. Authorization to access information and other computing services begins with administrative policies and procedures. The policies prescribe what information and computing services can be accessed, by whom, and under what conditions. The access control mechanisms are then configured to enforce these policies. Different computing systems are equipped with different kinds of access control mechanisms. Some may even offer a choice of different access control mechanisms. The access control mechanism a system offers will be based upon one of three approaches to access control, or it may be derived from a combination of the three approaches. Examples of common access control mechanisms in use today include role-based access control, available in many advanced database management systems; simple file permissions provided in the UNIX and Windows operating systems; Group Policy Objects provided in Windows network systems; and Kerberos, RADIUS, TACACS, and the simple access lists used in many firewalls and routers. To be effective, policies and other security controls must be enforceable and upheld. Effective policies ensure that people are held accountable for their actions. The U.S. Treasury's guidelines for systems processing sensitive or proprietary information, for example, states that all failed and successful authentication and access attempts must be logged, and all access to information must leave some type of audit trail. Also, the need-to-know principle needs to be in effect when talking about access control. This principle gives access rights to a person to perform their job functions. This principle is used in the government when dealing with difference clearances. Even though two employees in different departments have a top-secret clearance, they must have a need-to-know in order for information to be exchanged. Within the need-to-know principle, network administrators grant the employee the least amount of privileges to prevent employees from accessing more than what they are supposed to. Need-to-know helps to enforce the confidentiality-integrity-availability triad. Need-to-know directly impacts the confidential area of the triad. Information security uses cryptography to transform usable information into a form that renders it unusable by anyone other than an authorized user; this process is called encryption. Information that has been encrypted (rendered unusable) can be transformed back into its original usable form by an authorized user who possesses the cryptographic key, through the process of decryption. Cryptography is used in information security to protect information from unauthorized or accidental disclosure while the information is in transit (either electronically or physically) and while information is in storage. Cryptography provides information security with other useful applications as well, including improved authentication methods, message digests, digital signatures, non-repudiation, and encrypted network communications. Older, less secure applications such as Telnet and File Transfer Protocol (FTP) are slowly being replaced with more secure applications such as Secure Shell (SSH) that use encrypted network communications. Wireless communications can be encrypted using protocols such as WPA/WPA2 or the older (and less secure) WEP. Wired communications (such as ITU‑T G.hn) are secured using AES for encryption and X.1035 for authentication and key exchange. Software applications such as GnuPG or PGP can be used to encrypt data files and email. Cryptography can introduce security problems when it is not implemented correctly. Cryptographic solutions need to be implemented using industry-accepted solutions that have undergone rigorous peer review by independent experts in cryptography. The length and strength of the encryption key is also an important consideration. A key that is weak or too short will produce weak encryption. The keys used for encryption and decryption must be protected with the same degree of rigor as any other confidential information. They must be protected from unauthorized disclosure and destruction and they must be available when needed. Public key infrastructure (PKI) solutions address many of the problems that surround key management. The terms "reasonable and prudent person," "due care" and "due diligence" have been used in the fields of finance, securities, and law for many years. In recent years these terms have found their way into the fields of computing and information security. U.S. Federal Sentencing Guidelines now make it possible to hold corporate officers liable for failing to exercise due care and due diligence in the management of their information systems. In the business world, stockholders, customers, business partners and governments have the expectation that corporate officers will run the business in accordance with accepted business practices and in compliance with laws and other regulatory requirements. This is often described as the "reasonable and prudent person" rule. A prudent person takes due care to ensure that everything necessary is done to operate the business by sound business principles and in a legal, ethical manner. A prudent person is also diligent (mindful, attentive, ongoing) in their due care of the business. Attention should be made to two important points in these definitions. First, in due care, steps are taken to show; this means that the steps can be verified, measured, or even produce tangible artifacts. Second, in due diligence, there are continual activities; this means that people are actually doing things to monitor and maintain the protection mechanisms, and these activities are ongoing. Organizations have a responsibility with practicing duty of care when applying information security. The Duty of Care Risk Analysis Standard (DoCRA) provides principles and practices for evaluating risk. It considers all parties that could be affected by those risks. DoCRA helps evaluate safeguards if they are appropriate in protecting others from harm while presenting a reasonable burden. With increased data breach litigation, companies must balance security controls, compliance, and its mission. Request: Anyone can request a change. The person making the change request may or may not be the same person that performs the analysis or implements the change. When a request for change is received, it may undergo a preliminary review to determine if the requested change is compatible with the organizations business model and practices, and to determine the amount of resources needed to implement the change. Approve: Management runs the business and controls the allocation of resources therefore, management must approve requests for changes and assign a priority for every change. Management might choose to reject a change request if the change is not compatible with the business model, industry standards or best practices. Management might also choose to reject a change request if the change requires more resources than can be allocated for the change. Plan: Planning a change involves discovering the scope and impact of the proposed change; analyzing the complexity of the change; allocation of resources and, developing, testing and documenting both implementation and back-out plans. Need to define the criteria on which a decision to back out will be made. Test: Every change must be tested in a safe test environment, which closely reflects the actual production environment, before the change is applied to the production environment. The backout plan must also be tested. Schedule: Part of the change review board's responsibility is to assist in the scheduling of changes by reviewing the proposed implementation date for potential conflicts with other scheduled changes or critical business activities. Communicate: Once a change has been scheduled it must be communicated. The communication is to give others the opportunity to remind the change review board about other changes or critical business activities that might have been overlooked when scheduling the change. The communication also serves to make the help desk and users aware that a change is about to occur. Another responsibility of the change review board is to ensure that scheduled changes have been properly communicated to those who will be affected by the change or otherwise have an interest in the change. Implement: At the appointed date and time, the changes must be implemented. Part of the planning process was to develop an implementation plan, testing plan and, a back out plan. If the implementation of the change should fail or, the post implementation testing fails or, other "drop dead" criteria have been met, the back out plan should be implemented. Document: All changes must be documented. The documentation includes the initial request for change, its approval, the priority assigned to it, the implementation, testing and back out plans, the results of the change review board critique, the date/time the change was implemented, who implemented it, and whether the change was implemented successfully, failed or postponed. Post-change review: The change review board should hold a post-implementation review of changes. It is particularly important to review failed and backed out changes. The review board should try to understand the problems that were encountered, and look for areas for improvement. Business continuity management (BCM) concerns arrangements aiming to protect an organization's critical business functions from interruption due to incidents, or at least minimize the effects. BCM is essential to any organization to keep technology and business in line with current threats to the continuation of business as usual. The BCM should be included in an organizations risk analysis plan to ensure that all of the necessary business functions have what they need to keep going in the event of any type of threat to any business function. Assurance, e.g., testing against specified requirements; measuring, analyzing and reporting key parameters; conducting additional tests, reviews and audits for greater confidence that the arrangements will go to plan if invoked. Whereas BCM takes a broad approach to minimizing disaster-related risks by reducing both the probability and the severity of incidents, a disaster recovery plan (DRP) focuses specifically on resuming business operations as quickly as possible after a disaster. A disaster recovery plan, invoked soon after a disaster occurs, lays out the steps necessary to recover critical information and communications technology (ICT) infrastructure. Disaster recovery planning includes establishing a planning group, performing risk assessment, establishing priorities, developing recovery strategies, preparing inventories and documentation of the plan, developing verification criteria and procedure, and lastly implementing the plan. Below is a partial listing of governmental laws and regulations in various parts of the world that have, had, or will have, a significant effect on data processing and information security. Important industry sector regulations have also been included when they have a significant impact on information security. The U.K. Data Protection Act 1998 makes new provisions for the regulation of the processing of information relating to individuals, including the obtaining, holding, use or disclosure of such information. The European Union Data Protection Directive (EUDPD) requires that all E.U. members adopt national regulations to standardize the protection of data privacy for citizens throughout the E.U. The Computer Misuse Act 1990 is an Act of the U.K. Parliament making computer crime (e.g., hacking) a criminal offense. The act has become a model upon which several other countries, including Canada and the Republic of Ireland, have drawn inspiration from when subsequently drafting their own information security laws. The E.U. 's Data Retention Directive (annulled) required internet service providers and phone companies to keep data on every electronic message sent and phone call made for between six months and two years. The Family Educational Rights and Privacy Act (FERPA) (20 U.S.C. § 1232 g; 34 CFR Part 99) is a U.S. Federal law that protects the privacy of student education records. The law applies to all schools that receive funds under an applicable program of the U.S. Department of Education. Generally, schools must have written permission from the parent or eligible student in order to release any information from a student's education record. The Federal Financial Institutions Examination Council's (FFIEC) security guidelines for auditors specifies requirements for online banking security. The Health Insurance Portability and Accountability Act (HIPAA) of 1996 requires the adoption of national standards for electronic health care transactions and national identifiers for providers, health insurance plans, and employers. Additionally, it requires health care providers, insurance providers and employers to safeguard the security and privacy of health data. The Gramm–Leach–Bliley Act of 1999 (GLBA), also known as the Financial Services Modernization Act of 1999, protects the privacy and security of private financial information that financial institutions collect, hold, and process. Section 404 of the Sarbanes–Oxley Act of 2002 (SOX) requires publicly traded companies to assess the effectiveness of their internal controls for financial reporting in annual reports they submit at the end of each fiscal year. Chief information officers are responsible for the security, accuracy and the reliability of the systems that manage and report the financial data. The act also requires publicly traded companies to engage with independent auditors who must attest to, and report on, the validity of their assessments. The Payment Card Industry Data Security Standard (PCI DSS) establishes comprehensive requirements for enhancing payment account data security. It was developed by the founding payment brands of the PCI Security Standards Council — including American Express, Discover Financial Services, JCB, MasterCard Worldwide and Visa International — to help facilitate the broad adoption of consistent data security measures on a global basis. The PCI DSS is a multifaceted security standard that includes requirements for security management, policies, procedures, network architecture, software design and other critical protective measures. The Personal Information Protection and Electronics Document Act (PIPEDA) of Canada supports and promotes electronic commerce by protecting personal information that is collected, used or disclosed in certain circumstances, by providing for the use of electronic means to communicate or record information or transactions and by amending the Canada Evidence Act, the Statutory Instruments Act and the Statute Revision Act. Greece's Hellenic Authority for Communication Security and Privacy (ADAE) (Law 165/2011) establishes and describes the minimum information security controls that should be deployed by every company which provides electronic communication networks and/or services in Greece in order to protect customers' confidentiality. These include both managerial and technical controls (e.g., log records should be stored for two years). Greece's Hellenic Authority for Communication Security and Privacy (ADAE) (Law 205/2013) concentrates around the protection of the integrity and availability of the services and data offered by Greek telecommunication companies. The law forces these and other related companies to build, deploy and test appropriate business continuity plans and redundant infrastructures. Attitudes: Employees’ feelings and emotions about the various activities that pertain to the organizational security of information. Behaviors: Actual or intended activities and risk-taking actions of employees that have direct or indirect impact on information security. Cognition: Employees' awareness, verifiable knowledge, and beliefs regarding practices, activities, and self-efficacy relation that are related to information security. Communication: Ways employees communicate with each other, sense of belonging, support for security issues, and incident reporting. Compliance: Adherence to organizational security policies, awareness of the existence of such policies and the ability to recall the substance of such policies. Norms: Perceptions of security-related organizational conduct and practices that are informally deemed either normal or deviant by employees and their peers, e.g. hidden expectations regarding security behaviors and unwritten rules regarding uses of information-communication technologies. Responsibilities: Employees' understanding of the roles and responsibilities they have as a critical factor in sustaining or endangering the security of information, and thereby the organization. Andersson and Reimers (2014) found that employees often do not see themselves as part of the organization Information Security "effort" and often take actions that ignore organizational information security best interests. Research shows information security culture needs to be improved continuously. In Information Security Culture from Analysis to Change, authors commented, "It's a never ending process, a cycle of evaluation and change or maintenance." To manage the information security culture, five steps should be taken: pre-evaluation, strategic planning, operative planning, implementation, and post-evaluation. The International Organization for Standardization (ISO) is a consortium of national standards institutes from 157 countries, coordinated through a secretariat in Geneva, Switzerland. ISO is the world's largest developer of standards. ISO 15443: "Information technology – Security techniques – A framework for IT security assurance", ISO/IEC 27002: "Information technology – Security techniques – Code of practice for information security management", ISO-20000: "Information technology – Service management", and ISO/IEC 27001: "Information technology – Security techniques – Information security management systems – Requirements" are of particular interest to information security professionals. The US National Institute of Standards and Technology (NIST) is a non-regulatory federal agency within the U.S. Department of Commerce. The NIST Computer Security Division develops standards, metrics, tests and validation programs as well as publishes standards and guidelines to increase secure IT planning, implementation, management and operation. NIST is also the custodian of the U.S. Federal Information Processing Standard publications (FIPS). The Internet Society is a professional membership society with more than 100 organizations and over 20,000 individual members in over 180 countries. It provides leadership in addressing issues that confront the future of the internet, and it is the organizational home for the groups responsible for internet infrastructure standards, including the Internet Engineering Task Force (IETF) and the Internet Architecture Board (IAB). The ISOC hosts the Requests for Comments (RFCs) which includes the Official Internet Protocol Standards and the RFC-2196 Site Security Handbook. The Information Security Forum (ISF) is a global nonprofit organization of several hundred leading organizations in financial services, manufacturing, telecommunications, consumer goods, government, and other areas. It undertakes research into information security practices and offers advice in its biannual Standard of Good Practice and more detailed advisories for members. The Institute of Information Security Professionals (IISP) is an independent, non-profit body governed by its members, with the principal objective of advancing the professionalism of information security practitioners and thereby the professionalism of the industry as a whole. The institute developed the IISP Skills Framework. This framework describes the range of competencies expected of information security and information assurance professionals in the effective performance of their roles. It was developed through collaboration between both private and public sector organizations and world-renowned academics and security leaders. The German Federal Office for Information Security (in German Bundesamt für Sicherheit in der Informationstechnik (BSI)) BSI-Standards 100-1 to 100-4 are a set of recommendations including "methods, processes, procedures, approaches and measures relating to information security". The BSI-Standard 100-2 IT-Grundschutz Methodology describes how information security management can be implemented and operated. The standard includes a very specific guide, the IT Baseline Protection Catalogs (also known as IT-Grundschutz Catalogs). Before 2005, the catalogs were formerly known as "IT Baseline Protection Manual". The Catalogs are a collection of documents useful for detecting and combating security-relevant weak points in the IT environment (IT cluster). The collection encompasses as of September 2013 over 4,400 pages with the introduction and catalogs. The IT-Grundschutz approach is aligned with to the ISO/IEC 2700x family. The European Telecommunications Standards Institute standardized a catalog of information security indicators, headed by the Industrial Specification Group (ISG) ISI. ^ a b c d e f Andress, J. (2014). The Basics of Information Security: Understanding the Fundamentals of InfoSec in Theory and Practice. Syngress. p. 240. ISBN 9780128008126. ^ "What is Information Security? (with pictures)". wiseGEEK. Retrieved 2017-10-06. ^ a b c Schlienger, Thomas; Teufel, Stephanie (December 2003). "Information security culture - from analysis to change". South African Computer Society (SAICSIT). 2003 (31): 46–52. hdl:10520/EJC27949. ^ a b Samonas, S.; Coss, D. (2014). "The CIA Strikes Back: Redefining Confidentiality, Integrity and Availability in Security". Journal of Information System Security. 10 (3): 21–45. ^ "Gartner Says Digital Disruptors Are Impacting All Industries; Digital KPIs Are Crucial to Measuring Success". Gartner. 2 October 2017. Retrieved 25 January 2018. ^ "Gartner Survey Shows 42 Percent of CEOs Have Begun Digital Business Transformation". Gartner. 24 April 2017. Retrieved 25 January 2018. ^ "Information Security Qualifications Fact Sheet" (PDF). IT Governance. Retrieved 16 March 2018. ^ Stewart, James (2012). CISSP Study Guide. Canada: John Wiley & Sons, Inc. pp. 255–257. ISBN 978-1-118-31417-3. ^ Gordon, Lawrence; Loeb, Martin (November 2002). "The Economics of Information Security Investment". ACM Transactions on Information and System Security. 5 (4): 438–457. doi:10.1145/581271.581274. ^ Stewart, James (2012). CISSP Certified Information Systems Security Professional Study Guide Sixth Edition. Canada: John Wiley & Sons, Inc. pp. 255–257. ISBN 978-1-118-31417-3. ^ Suetonius Tranquillus, Gaius (2008). Lives of the Caesars (Oxford World's Classics). New York: Oxford University Press. p. 28. ISBN 978-0-19-953756-3. ^ Singh, Simon (2000). The Code Book. Anchor. pp. 289–290. ISBN 978-0-385-49532-5. ^ Johnson, John (1997). The Evolution of British Sigint: 1653–1939. Her Majesty's Stationery Office. ASIN B00GYX1GX2. ^ Ruppert, K. (2011). "Official Secrets Act (1889; New 1911; Amended 1920, 1939, 1989)". In Hastedt, G.P. Spies, Wiretaps, and Secret Operations: An Encyclopedia of American Espionage. 2. ABC-CLIO. pp. 589–590. ISBN 9781851098088. ^ a b Sebag–Montefiore, H. (2011). Enigma: The Battle for the Code. Orion. p. 576. ISBN 9781780221236. ^ DeNardis, L. (2007). "Chapter 24: A History of Internet Security". In de Leeuw, K.M.M. ; Bergstra, J. The History of Information Security: A Comprehensive Handbook. Elsevier. pp. 681–704. ISBN 9780080550589. ^ ISO/IEC 27000:2009 (E). (2009). Information technology – Security techniques – Information security management systems – Overview and vocabulary. ISO/IEC. ^ Anderson, J. M. (2003). "Why we need a new definition of information security". Computers & Security. 22 (4): 308–313. doi:10.1016/S0167-4048(03)00407-3. ^ Venter, H. S.; Eloff, J. H. P. (2003). "A taxonomy for information security technologies". Computers & Security. 22 (4): 299–307. doi:10.1016/S0167-4048(03)00406-1. ^ Perrin, Chad. "The CIA Triad". Retrieved 31 May 2012. ^ a b "Engineering Principles for Information Technology Security" (PDF). csrc.nist.gov. ^ "oecd.org" (PDF). Archived from the original (PDF) on May 16, 2011. Retrieved 2014-01-17. ^ Slade, Rob. "(ICS)2 Blog". ^ Aceituno, Vicente. "Open Information Security Maturity Model". Retrieved 12 February 2017. ^ Hughes, Jeff; Cybenko, George (21 June 2018). "Quantitative Metrics and Risk Assessment: The Three Tenets Model of Cybersecurity". Technology Innovation Management Review. 3 (8). ^ Teplow, Lily. "Are Your Clients Falling for These IT Security Myths? [CHART]". 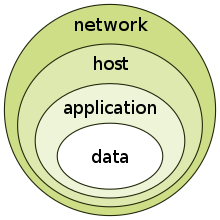 continuum.net. ^ Beckers, K. (2015). Pattern and Security Requirements: Engineering-Based Establishment of Security Standards. Springer. p. 100. ISBN 9783319166643. ^ Boritz, J. Efrim (2005). "IS Practitioners' Views on Core Concepts of Information Integrity". International Journal of Accounting Information Systems. Elsevier. 6 (4): 260–279. doi:10.1016/j.accinf.2005.07.001. Retrieved 12 August 2011. ^ McCarthy, C. (2006). "Digital Libraries: Security and Preservation Considerations". In Bidgoli, H. Handbook of Information Security, Threats, Vulnerabilities, Prevention, Detection, and Management. 3. John Wiley & Sons. pp. 49–76. ISBN 9780470051214. ^ ISACA (2006). CISA Review Manual 2006. Information Systems Audit and Control Association. p. 85. ISBN 978-1-933284-15-6. ^ Spagnoletti, Paolo; Resca A. (2008). "The duality of Information Security Management: fighting against predictable and unpredictable threats". Journal of Information System Security. 4 (3): 46–62. ^ Grama, J.L. (2014). Legal Issues in Information Security. Jones & Bartlett Learning. p. 550. ISBN 9781284151046. ^ Kiountouzis, E.A. ; Kokolakis, S.A. (1996-05-31). Information systems security: facing the information society of the 21st century. London: Chapman & Hall, Ltd. ISBN 978-0-412-78120-9. ^ Newsome, B. (2013). A Practical Introduction to Security and Risk Management. SAGE Publications. p. 208. ISBN 9781483324852. ^ a b Whitman, M.E. ; Mattord, H.J. (2016). Management of Information Security (5th ed.). Cengage Learning. p. 592. ISBN 9781305501256. ^ "NIST SP 800-30 Risk Management Guide for Information Technology Systems" (PDF). Retrieved 2014-01-17. ^ Johnson, L. (2015). Security Controls Evaluation, Testing, and Assessment Handbook. Syngress. p. 678. ISBN 9780128025642. ^ Ransome, J.; Misra, A. (2013). Core Software Security: Security at the Source. CRC Press. pp. 40–41. ISBN 9781466560956. ^ "Segregation of Duties Control matrix". ISACA. 2008. Archived from the original on 3 July 2011. Retrieved 2008-09-30. ^ Kakareka, A. (2013). "Chapter 31: What is Vulnerability Assessment?". In Vacca, J.R. Computer and Information Security Handbook (2nd ed.). Elsevier. pp. 541–552. ISBN 9780123946126. ^ a b Bayuk, J. (2009). "Chapter 4: Information Classification". In Axelrod, C.W. ; Bayuk, J.L. ; Schutzer, D. Enterprise Information Security and Privacy. Artech House. pp. 59–70. ISBN 9781596931916. ^ "Business Model for Information Security (BMIS)". ISACA. Retrieved 25 January 2018. ^ Akpeninor, James Ohwofasa (2013). Modern Concepts of Security. Bloomington, IN: AuthorHouse. p. 135. ISBN 978-1-4817-8232-6. Retrieved 18 January 2018. ^ "The Use of Audit Trails to Monitor Key Networks and Systems Should Remain Part of the Computer Security Material Weakness". www.treasury.gov. Retrieved 2017-10-06. ^ Vallabhaneni, S.R. (2008). Corporate Management, Governance, and Ethics Best Practices. John Wiley & Sons. p. 288. ISBN 9780470255803. ^ Shon Harris (2003). All-in-one CISSP Certification Exam Guide (2nd ed.). Emeryville, California: McGraw-Hill/Osborne. ISBN 978-0-07-222966-0. ^ "The Duty of Care Risk Analysis Standard". DoCRA. ^ Westby, J.R.; Allen, J.H. (August 2007). "Governing for Enterprise Security (GES) Implementation Guide" (PDF). Software Engineering Institute. Retrieved 25 January 2018. ^ Campbell, T. (2016). "Chapter 14: Secure Systems Development". Practical Information Security Management: A Complete Guide to Planning and Implementation. Apress. p. 218. ISBN 9781484216859. ^ Taylor, J. (2008). "Chapter 10: Understanding the Project Change Process". Project Scheduling and Cost Control: Planning, Monitoring and Controlling the Baseline. J. Ross Publishing. pp. 187–214. ISBN 9781932159110. ^ "book summary of The Visible Ops Handbook: Implementing ITIL in 4 Practical and Auditable Steps". wikisummaries.org. Retrieved 2016-06-22. ^ Hotchkiss, Stuart. Business Continuity Management : In Practice, British Informatics Society Limited, 2010. ProQuest Ebook Central, http://ebookcentral.proquest.com/lib/pensu/detail.action?docID=634527. ^ "The Disaster Recovery Plan". Sans Institute. Retrieved 7 February 2012. ^ "Data Protection Act 1998". legislation.gov.uk. The National Archives. Retrieved 25 January 2018. ^ "Computer Misuse Act 1990". legislation.gov.uk. The National Archives. Retrieved 25 January 2018. ^ "Directive 2006/24/EC of the European Parliament and of the Council of 15 March 2006". EUR-Lex. European Union. Retrieved 25 January 2018. ^ "Audit Booklet". Information Technology Examination Handbook. FFIEC. Retrieved 25 January 2018. ^ "Public Law 104 - 191 - Health Insurance Portability and Accountability Act of 1996". U.S. Government Publishing Office. Retrieved 25 January 2018. ^ "Public Law 106 - 102 - Gramm–Leach–Bliley Act of 1999" (PDF). U.S. Government Publishing Office. Retrieved 25 January 2018. ^ "Public Law 107 - 204 - Sarbanes-Oxley Act of 2002". U.S. Government Publishing Office. Retrieved 25 January 2018. ^ "Payment Card Industry (PCI) Data Security Standard: Requirements and Security Assessment Procedures - Version 3.2" (PDF). Security Standards Council. April 2016. Retrieved 25 January 2018. ^ "Security Breach Notification Laws". National Conference of State Legislatures. 12 April 2017. Retrieved 25 January 2018. ^ "Personal Information Protection and Electronic Documents Act" (PDF). Canadian Minister of Justice. Retrieved 25 January 2018. ^ "Regulation for the Assurance of Confidentiality in Electronic Communications" (PDF). Government Gazette of the Hellenic Republic. 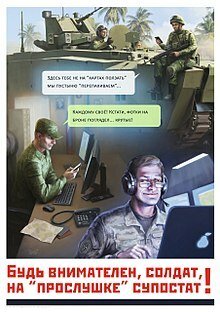 Hellenic Authority for Communication Security and Privacy. 17 November 2011. Retrieved 25 January 2018. ^ "Αριθμ. απόφ. 205/2013" (PDF). Government Gazette of the Hellenic Republic. Hellenic Authority for Communication Security and Privacy. 15 July 2013. Retrieved 25 January 2018. ^ Roer, Kai; Petric, Gregor (2017). The 2017 Security Culture Report - In depth insights into the human factor. CLTRe North America, Inc. pp. 42–43. ISBN 978-1544933948. ^ "BSI-Standards". BSI. Retrieved 29 November 2013. Easttom, C., Computer Security Fundamentals (2nd Edition) Pearson Education, 2011. Dustin, D., " Awareness of How Your Data is Being Used and What to Do About It", "CDR Blog", May 2017. Allen, Julia H. (2001). The CERT Guide to System and Network Security Practices. Boston, MA: Addison-Wesley. ISBN 978-0-201-73723-3. Krutz, Ronald L.; Russell Dean Vines (2003). The CISSP Prep Guide (Gold ed.). Indianapolis, IN: Wiley. ISBN 978-0-471-26802-4. McNab, Chris (2004). Network Security Assessment. Sebastopol, CA: O'Reilly. ISBN 978-0-596-00611-2. Peltier, Thomas R. (2001). Information Security Risk Analysis. Boca Raton, FL: Auerbach publications. ISBN 978-0-8493-0880-2. Peltier, Thomas R. (2002). Information Security Policies, Procedures, and Standards: guidelines for effective information security management. Boca Raton, FL: Auerbach publications. ISBN 978-0-8493-1137-6. White, Gregory (2003). All-in-one Security+ Certification Exam Guide. Emeryville, CA: McGraw-Hill/Osborne. ISBN 978-0-07-222633-1.